Oh, the todders. As, um, challenging as they may be, they are really fun to gift - finally at the age where they'll be into the holidays (and not just the boxes and wrapping paper), this is the first year that I really am excited to choose specific presents for sweet baby Georgia. This year, I'm focusing on make believe, fostering her imagination and developmental toys to keep her engaged and interested. Georgia will be almost 19 months old on Christmas Day so this guide is geared toward the under three crowd. 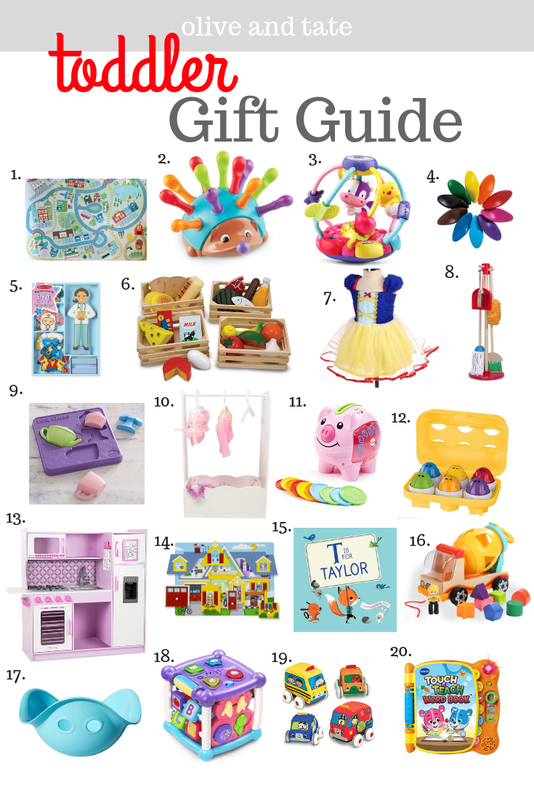 If you're searching for first Christmas gifting inspo click here and the preschooler ideas are here! I am a huge fan of Camp Castle products and fell even more in love when I met the family behind them at a pop event recently. Each play mat is hand designed by Hayley, the mama of the group, and trust me when I say that each illustration is gorgeous. My kiddos each have the mini/placemat sized version (Gray has this one and Georgie loves her princess castle) but I love the larger version for a play space. The material is perfect for a playroom - sturdy and easy to wipe down) and will work perfectly over carpet or hardwoods. If you happen to live in Florida, Texas, Utah or California, you're gonna need to pop over to the site! This little hedgehog is perfect for teaching little fingers fine motor skills with a side of basic color knowledge. As a bonus, the quills are peg shaped and store inside the hedgehog to keep pieces from getting lost. Equipped with a motion sensor, voiced numbers, letters and colors, plus shake and rattle toys, this is perfect for the younger toddlers. This crayon set is new to me and I am obsessed with them - the unique shape is meant to encourage early hand and finger grip on either hand. They are non-toxic, erasable and made of eco-friendly polymer because we all know they'll go directly into a toddler mouth the second they're out of the package. Georgia will be getting a set of these in her stocking! Also available in a "Joey" version - Julia comes with 24 pieces and can be dressed "for success" as everything from a firewoman to a superhero and artist. Melissa and Doug toys are favorites in our house and the wood/quality constructions ensures they last. I chose this set of pretend food for the crates, honestly. I love a play set that comes with it's own obvious storage solution because it encourages my kiddos to put their toys away without having to be specific about where it goes. As long as the food ends up in the crates, it counts! We chose the pink version of this dress up brand as Georgia's halloween costume and I was pleasantly surprised with the quality for the price point. Soft, sturdy and easy to get on and off, we'll add a few more to our dress up trunk for the holidays. If this inspires my toddler to start cleaning, I'm here for it. She does love to follow me around the kitchen "helping" so this year, I'm giving her the tools to make and impact. Also available in a Dump Truck version - big pieces for little toddler hands and the unique 3D design make this puzzle a unique choice - I also really love the price point! I think this sweet little dress up rack will be Georgie's big gift from Santa this year. She's very into dress up and I don't have a way to store her gear just yet. I love the hanging option but also the open bin below to handle the shoes, tiaras and miscellaneous pieces. Georgia's toddler class has this piggy bank and it was her favorite toy on her very first visit to the classroom. This Piggy Bank has Smart Stages technology which means the learning content can change as the baby grows. The coins each have an animal on one side and a number on the other, along with songs and sounds played by the bank as each coin drops in. Inside of the egg carton is lined with different shapes that correspond with the shape on the bottom of each egg - to put them in their place, shapes have to be matched and then the chick will "hatch". Each chick is a different color and they make a chirping sound when you press them into their eggs. If you're in the market for a big gift, the play kitchen can't be beat. This particular version is by Melissa and Doug, has a pink retro vibe (but is also available in a grey version) and an ice dispenser. We love wooden sound puzzles around here, they're sturdy and can take a beating, plus the sound seems to catch and keep my 16 month old's attention. We still have a few from when Gray was that age but we're always updating Georgia's stash on special occasions. The perfect beginner alphabet book, this personalized version includes the first letter of your child's name. The illustrations are simple and sweet, Georgia will for sure find this under our tree this year. I love that this toy combines three or four classic toddler toys into one - the shape matching cube we all know and love, a pull toy and a construction truck in one, this wooden shape sorter truck is amazing. Just like the Teeter Popper from the Preschooler Gift Guide, I am in love with the Bilibo from a sensory perspective. The Bilibo was designed with child development experts to encourage sensory seeking, imaginative play and, you know, to get those wiggles out. The Bilibo can be a seat, a shell, used for rocking, used for laying, basically whatever your little can come up with. Literally the thing that stood out to me most with this learning cube is that the sound can be turned down for "quieter play". In all seriousness, it combines sounds, songs, letters, numbers and shapes to teach your babes as they play. It's also available in a primary color scheme, if that's more your speed. Baby's first race cars! This soft sided set of pull-back cars would be perfect to use on your Camp Castle Play Mat. I would pop open this set of 4 and wrap each vehicle individually for a full stocking! Designed for 18 months to 4 years, the goal of the Touch and Teach book is to introduce over 100 sight words. The coolest part is the book can be set to a handful of learning modes like teaching individual letters, seek and find and Music Time. In our house, this will be the perfect option for little sister while her brother plays on his tablet! My daughter had the purple version of those dresses and I was surprised at how nice it was for only $10. Like handmade bu a grandmother nice! Your gift guides are SO good. Thank you for putting in the time to make these for us! !